Serious flooding has ravaged many parts of Asaba, the capital of Delta State, destroying official documents and some homes. 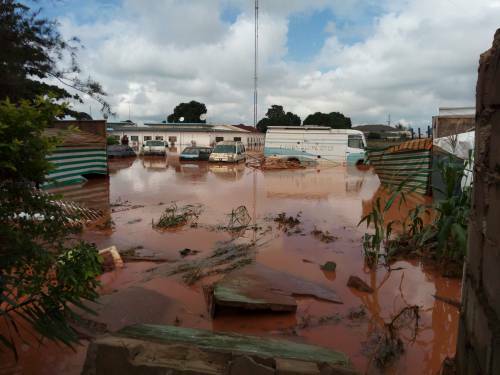 A heavy three-hour downpour has wreaked havoc on the Delta State capital, Asaba, and surrounding communities, a SaharaReporters report has shown. The torrential rain left numerous residents homeless and destroyed homes estimated at several millions of naira. Also destroyed were part of the Government House fence, computers, and vehicles. 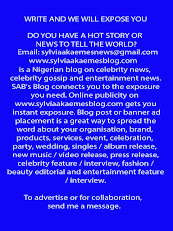 According to SaharaReporters, the rain started around 5 pm on Saturday and lasted over three hours. 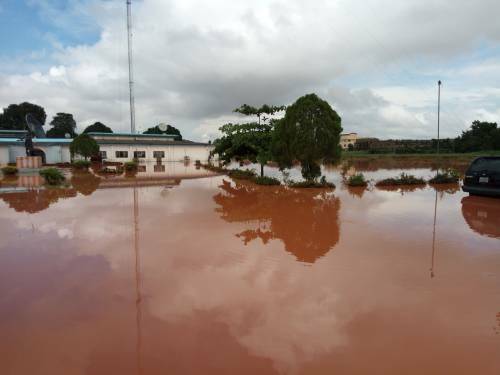 Eyewitnesses said the state secretariat, Delta Broadcasting Service, (DBS), State Security Service Road, Okpanam-Ibusa Road, Junior Staff Quarters Road, State Universal Basic Education Board, (SUBEB), and former legislative quarters, among others, were submerged by the flood. At the Delta Broadcasting Service, off Okpanam Road, staff who reported for morning duty were seen roaming about outside the main compound as the station remained off air, while office chairs, tables, computers, cameras, tapes, vital documents, records, writing materials and other personal belongings were seen floating on the water. At the secretariat housing the offices of Establishment, Post Primary Education Board, (PPEB), Fire Service, part of the Ministry of Information, Delta State Rural Development Agency among others, civil servants were seen crowded at the main gate of the secretariat as vital officials files, documents, official records, books, fridges, shelves, photocopiers, computers were also floating on the deep water. 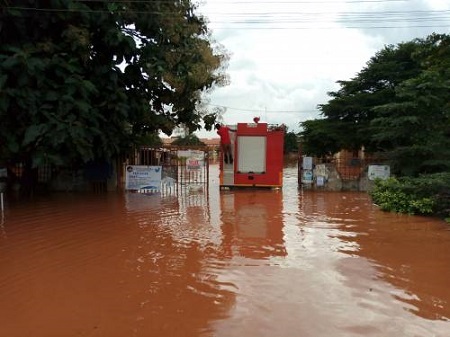 A civil servant accused Governor Ifeanyi Okowa of paying lip service to the incessant flooding in the state capital. 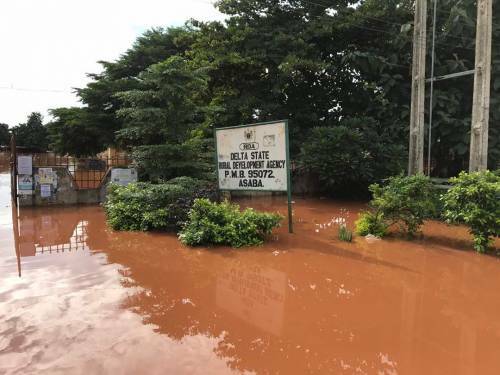 The Okowa administration recently claimed that the state government had released N100 million to the contractor handling a construction of diversion drainages to accommodate the flooding on Okpanam Road and other locations during heavy downpours, but several residents said no work has been done. Reacting to the flooding and destruction of official properties at the state secretariat, some of the civil servants urged Governor Okowa to stop ignoring the flood issue. "We have lost our official documents, files, our belongings, to the flood. You can see how everything is floating on the water," said one civil servant. He added, "The situation is irresponsible. Is Okowa saying allocation is not coming to the state.? What stopped the governor from tackling this problem since two years?" Another irate civil servant said he feared that the flood could have destroyed thousands of workers and pensioners' files at the state secretariat. 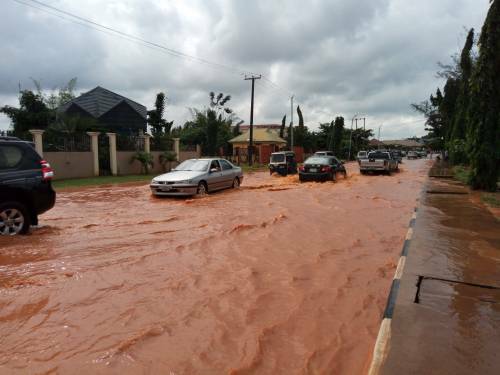 "Asaba flood is a man-made disaster, not the natural flooding people talk about," said another civil servant. According to him, "For the next one week, no official work can be done here in the state secretariat and DBS. Some of our colleagues who risked it to their offices for a rescue mission could not do anything because they were almost swallowed up by the water. Instead of addressing the flooding in Asaba, Okowa is busy awarding contracts to himself, his brothers, family members, and cronies." In another development, the Delta State Council of the Radio Television Theatre and Arts Workers Union of Nigeria (RATTAWU), has challenged Governor Okowa to give priority to the state-owned media organizations, Delta Broadcasting Service (DBS) in Asaba and Warri rather than any other electronic private media in and outside the state. The union made the demand last Thursday at the end of its executive meeting presided over by the state chairman, Onoriode Mukoro. The union urged Mr. Okowa to speed up the connection of the 33kva power line for DBS Asaba and Ubulu-uku sub station. They also emphasized the need for interconnectivity between DBS Asaba and Warri in order for the station to bring to Deltans events across the state on a single telecast. The union also stated it was important that the government provide outside broadcast vans (OB Vans) in order to achieve live broadcasts. They added, "The need for operational vehicles cannot be over emphasized as this will enhance the station's ability to comb the nook and crannies of the state in order to improve content, as well as aesthetics of our television screen, state of the art television cameras, editing facilities and well-designed backdrops for television productions, should be considered."